Available as low as $1.69 per oz over spot! The New Zealand Mint’s most popular coin program on an annual basis is the Niue Hawksbill. Although the coin has not always gone by this name, it remains one of the most popular bullion coins in the world and is sought after on a yearly basis by serious investors and collectors. The 2016 2 oz Silver New Zealand Niue Hawksbill is now available on Silver.com. Individual coins ship in plastic flips, lots of 10 coins ship in mint sealed tubes, and lots of 200 coins ship in mint sealed monster boxes. Bears a face value of $5 and is considered legal tender in Niue. Features the brilliant Hawksbill turtle design. Hawksbill turtle coins are so-named for their sharp, pointed beaks. However, it is their brilliantly colored shells with overlapping patterns that grab attention when snorkelers and divers interact with these beautiful sea tortoises. The Hawksbill turtle is found in tropical waters throughout the Atlantic, Indian, and Pacific Oceans. In this region in particular, they are typically found around the shores of Fiji, except for making their annual trips to the northern shores of New Zealand. Once a delicacy in the region, local populations have now rallied to protect the species as its numbers in the wild dwindle. 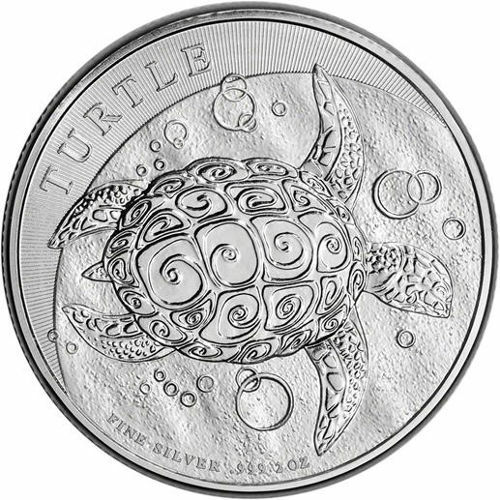 Each 2016 2 oz Silver New Zealand Niue Hawksbill coin in this Silver.com product listing has a Brilliant Uncirculated grade. BU coins show no signs of wear and tear, but often feature breaks in the luster, spotted surface, or other minor flaws. On the reverse is the image of a hawksbill turtle as it navigates the warm waters of the Pacific Ocean. This image has featured on the coins since their 2010 introduction, and remains unchanged today. The obverse bears the right-profile portrait of Queen Elizabeth II. This side also includes engravings identifying the nation of issue, year of issue, and face value of the coin. Located in the national capital of Auckland, the New Zealand Mint is a private facility not associated with the nation’s government. Official New Zealand dollars and coins are struck by the Royal Canadian Mint or Royal Mint in London. If you have questions, please feel free to contact Silver.com at 888-989-7223. We’re also available online using our live web chat or email features.